A brief bit of backstory and a cursory glance at the title Alien Predators reveals just about everything you need to know about this mid-80s lump of schlock. Shot in 1984 under the title The Falling, it wasn’t released in America until 1987 with the nakedly obvious aim of cashing in on the twin successes of Alien and Predator—this despite the fact that its budget was but a fraction of the ones for those studio tent-poles. Perhaps more accurate was one of the other alternate titles: Mutant II, though I suppose even fans of that Wings Hauser and Bo Derek joint might have been left disappointed by this one. Just about everyone would have been united in their dismay at one thing for sure: this movie offers little in the way of aliens, predators, or mutants for much of its runtime, which is mostly dedicated to a dopey—but weirdly affable—love triangle. The trio in question is Damon (Dennis Christopher), Michael (Martin Hewitt), and Samantha (Lynn Holly-Johnson), some American college students trekking through Spain on a road trip. They’ve made a pact not to let things get too awkward between them, despite the fact that Damon and Michael are both obviously pining over this sweet girl, who makes them breakfast and indulges their nonsense at every turn. They’re silly boys but also exceedingly decent ones, making them perfect company on a trip that gets strange in a hurry once they stumble upon a bizarre, desolate little town. The inhabitants here barely act human—and for good reason, it turns out, as the experimental space station Skylab crashed nearby a few years ago with an extraterrestrial parasite in tow. Now, only a lone scientist (Luis Prendes)—and, eventually, our three American college students—can thwart its attempt to spread across the globe. Technically, the stakes here are apocalyptic as hell; realistically, Alien Predators is working with the type of resources where we should feel grateful that it manages to put an RV, a dune buggy, and super-secret NASA facility (nestled within a castle!?) on screen for our enjoyment. Suffice it to say, this is a fairly small movie, one that roves in and around rural Spain, with the alien menace always lurking about. For much of its runtime, it’s a tale of two movies: one features Dr. Tracer and his goon assistant trying to get to the bottom of what should definitely be a global crisis, while the other finds our loveable trio goofing about with the locals and doing their best to maintain a platonic façade. Thankfully, we spend more time with the latter; it’s a choice that feels like it’d be a death knell in most cases, especially in a movie titled Alien Predators, which you definitely watch to see, you know, a killer alien instead of idiot college students. The gambit pays off here, though, because these three manage to work their charms on you via their increasingly silly dialogue. We learn that Damon and Michael have been friends since childhood, when they designated themselves “Greater Los Angeles champ” and “Hollywood’s number one driver,” respectively. Both have an obvious affinity for movies, as several lines of famous dialogue—not to mention the entirety of White Heat’s climax (a nod to Christopher’s role in Fade to Black, perhaps)—are recited throughout. There’s something both idiosyncratic yet completely natural about the camaraderie here, and love that they never let their competition for Samantha interfere with their friendship. She, too, is just an incredible sweetheart, and Holly-Johnson’s bubbly, bouncy personality emerges as the film’s heart and soul. It doesn’t take long to see why these guys are nuts about her—she’s just so damn nice and never feels like she’s above hanging out with these two goofballs. They’re all so pleasant that their charms eventually rub off on Dr. Tracer, whose deliberate line deliveries leave you wondering if he hasn’t already been possessed by the alien (if they don’t lull you to sleep first). In the company of our heroes, though, he becomes just as loveable, going so far as to needle one of the guys about the love triangle at one point. If your alien invasion movie is more concerned with stranding audiences with dopes, you had better be sincere as hell about it, and this movie is. I mean, its characters quote The Waltons, for heaven's sake. You don’t even have to imagine how this dynamic could play out in a lesser movie: with the group eventually disintegrating due to jealousy, practically inviting the audience to revel in their gory demise. Alien Predators doesn’t resort to that though, not by a long shot—this movie is so thoroughly congenial that you can hardly believe it even features a bloodthirsty alien in the first place. It mostly lurks around the margins for most of the movie, appearing in brief glimpses looking something like a sentient pile of spaghetti. Given the reputation of the (admittedly very small) “Alien on Earth” subgenre, you might expect a ton of schlock here; instead, director Deran Sarafian takes an unexpectedly restrained approach for a while. At times, Alien Predators is pretty eerie, especially whenever the characters find themselves in a town that’s been hollowed out by the parasite. You might see it as a byproduct of a meager budget unable to secure even some background extras; I see it as Sarafian cleverly working around a problem to craft some semblance of a pod people movie where a college kids are terrorized by a weird waitress looks like Ziggy Stardust and a mysterious vehicle that looks like it rolled in from The Road Warrior. As is often the case with this sort of thing, Alien Predators is a lot more fun when it’s treading into either nonsense or schlock. While it feels like it really needs a little bit more of both to send it truly over the top, it manages some spirited moments, most of them towards the end, when the alien menace is finally revealed in its true form. Along the way, you’re treated to a bombastically-scored car chase, alien roadkill, and, of course, a resolution to the love triangle. About the only misstep is the final shot, an obligatory, predictable “twist” that hints that the group’s ordeal isn’t over after all, a sort of mean-spirited gag that’s contrary to how good-natured this film is. It’s the sort of thing you’d expect—hell, maybe even crave—from most horror movies, but not Alien Predators, which might be the sweetest little alien splatter movie imaginable. 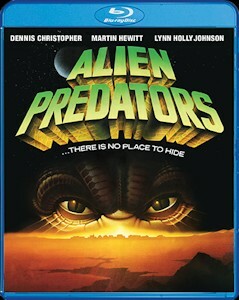 After quietly debuting on DVD a couple of years ago as part of MGM’s Limited Edition Collection, Alien Predators makes the leap all the way to Blu-ray courtesy of Scream Factory. In addition to receiving a high-def bump, the film also boasts a newly recorded commentary from director Sarafian and a theatrical trailer. Perhaps it’s not the most robust release in Scream’s catalog, but it’s a perfectly serviceable one for a movie that would have otherwise been just about completely forgotten. I’ll be honest: upon reflection—and during the course of writing this review—Alien Predators grew on me a bit. After all, it’s really hard to be too mad at a movie that’s trying this hard to be so nice, which is more than I can say for those two other movies that feature both “alien” and “predator” in their titles.